We travel up and down the east coast a lot. Although I currently hang my hat in Vermont, I have lived in Maine, New York, Maryland, and Florida. In each ephemeral landing spot, I’ve left behind a little bit of myself, not to mention countless friends and family members. This means that we spend lots of time traipsing around visiting loved ones — one of my favorite pastimes! The downside of course, is that with all the hustle and bustle in this part of the country, we have trouble finding back road adventures away from the elaborate interstate highway system. 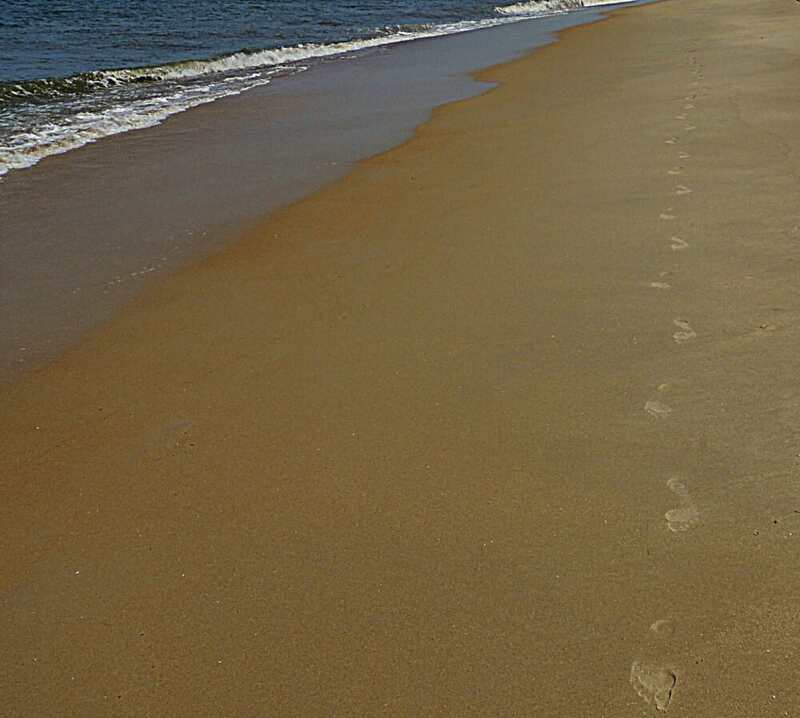 We keep trying though, and one of our most special finds is Cape Henlopen State Park in Lewes, Delaware. This gem of a park encompasses 5,193 acres in Sussex County. According to the Delaware State Parks website, the Cape Henlopen Beaches are some of the most popular in the state. What makes the park so awesome, though, is that there is way more to do than swim in the ocean or lie on the sand. Hiking, biking, fishing, disc golf, and kayaking are all easy ways to relax at Cape Henlopen. You could spend a week here and not run out of amazing things to do! When the thermometer maxed out at 96 degrees Fahrenheit, we were a little nervous. We drove our little car slowly through Lewes, DE and wondered if we should just keep driving. We had heard that Vermont was a balmy 75 degrees and we were just a day’s drive from home. 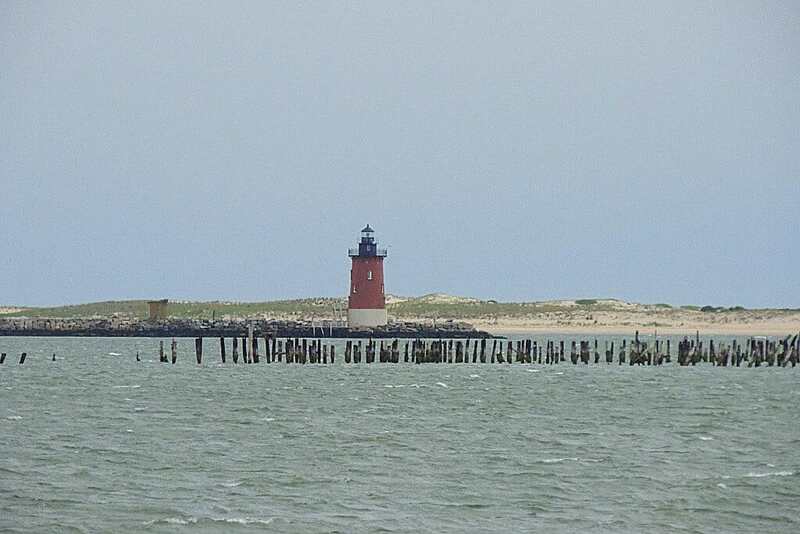 In the end, the draw of the ocean was too strong and we passed by the ferry launch that would take us into New Jersey, and headed into the wilds of Cape Henlopen State park. The park ranger who checked us in asked if we had brought an air conditioner for our tent. Was he kidding? Apparently there are such things. Have you used one? Instead, we bought a bag of ice for our tiny cooler. The ranger wished us luck, and we headed out to the Cape Henlopen Campground. We took it nice and slow through the park, making use of the air conditioner we did have, and the first thing we noticed was the amazing bike path that meandered through forest, field, and dune. Not only that, there were people using it — people who embrace the heat as summer’s best feature. I was sure we could do it too. It can be crowded in the Cape Henlopen campground, but the beach and trails make it all worthwhile. 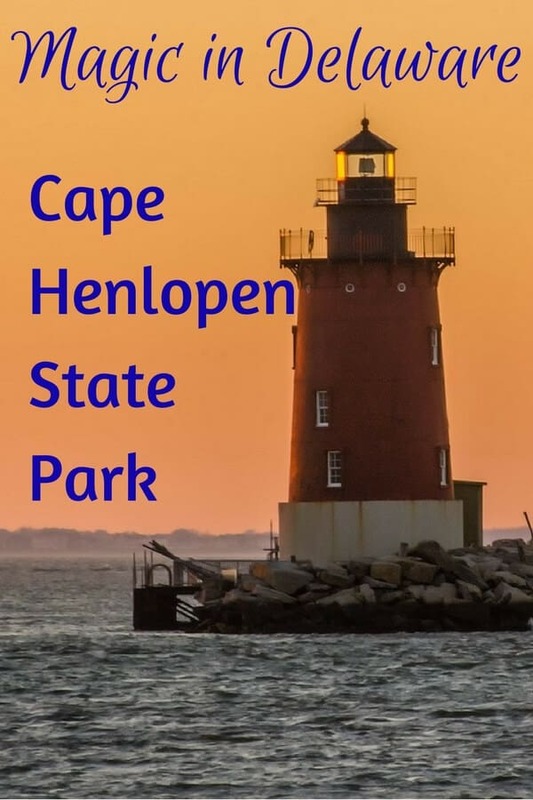 The Cape Henlopen Campground is not our favorite part of the park, but I wouldn’t hesitate to stay here for a week to access all of the awesome trails, beaches, and activities that are available for families. I want to give you a brief overview so you know what to expect, because really, to make the most of this special place, you have to stay a few days. 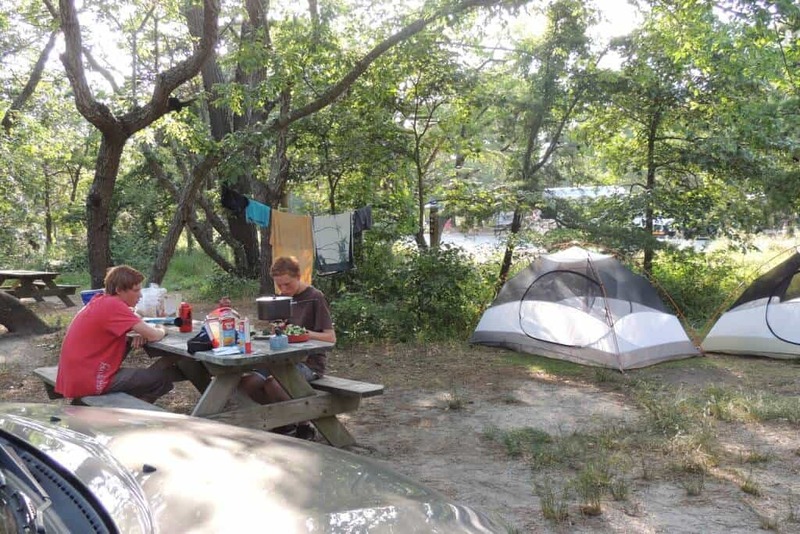 The Cape Henlopen campground area is divided into three sections. There’s the RV area, which is really most of the campground. You’ll also find a loop just for tenters and a row of cute cabins. We opted for a tent site, thinking it would be more peaceful, but the park doesn’t allow generators and quiet time is strictly enforced after 10 pm, so even the RV loop was really quiet. The campsites are flat and sandy with a good mix of shady and sunny sites, but they are packed pretty tightly together and offer very little in the way of privacy. The restrooms are clean and spacious, with hot showers (cold showers are better than air conditioning in your tent). The summer bugs, however, might send you over the edge, or at least to the beach. Biting flies harassed us during the day and mosquitoes came on duty in the evening. I know, it’s camping. We love it, really we do. Because Cape Henlopen State Park is a popular place, we recommend reserving your site well ahead of time. You can book your site on Reserve America. The cabins at Cape Henlopen State Park are really cute, and perfect if you have a small family and don’t want to deal with sandy sleeping bags and leaky tents (believe me, I was tempted). Although the cabins sleep 6, it’s a tight squeeze, with two sets of bunk beds in the back room, and a queen sofa bed in the front room. The cabins do have air conditioning, electricity, and a small fridge, which is awesome, but you still have to do your cooking outside. In my opinion the Cape Henlopen Cabins are the perfect solution for families who love playing outside, but not necessarily sleeping outside. Those bugs are ruthless, let me tell you! The other awesome thing is that the Cape Henlopen cabins are open year round, and if you are like me, and don’t need to actually sunbathe or swim in the ocean, then a fall visit may be just your thing. Please note that pets are not allowed in any of the cabins. Even on a hot, busy weekend, there were empty expanses of beach! By the time we had lunch, fended off a million biting insects, and changed into swimwear, the temperature had soared to 104 degrees. Time to chill out in the Atlantic. The park is big enough that you have to drive from your campsite to the beach. Okay, you don’t actually have to, but if you’re a northerner suffering through a sweltering summer day, take the car and don’t feel guilty. So the Cape Henlopen Beach — it’s pretty much perfect, and is definitely one of my all-time favorite East-Coast beaches. It can be busy right by the concession and shower area, with good lifeguard coverage, but the expansive strip of sand quickly fades into serenity as you walk either north or south along the shore. The water was blissfully cold at the end of June, a good 10 degrees colder than the same ocean three hours south in Virginia Beach. During our visit to Cape Henlopen Beach, the waves stayed small, even during a pretty spectacular thunderstorm, but some of the other campers mentioned that the little waves were unusual. We meandered along the shore, watched lots of shorebirds and frolicking dolphins in the surf, and hundreds of horseshoe crabs chillin’ in the quiet bayside waters. There’s a special surfing beach, a beach just for fishing, and a lovely bayside beach with quiet water for the families with littles. A storm rolling in on the bayside of Cape Henlopen. With so much room to spread out, Cape Henlopen Beach never feels crowded, and the grass covered dunes add a touch of wild to the rugged shore. If you’ve never been to the beaches at Cape Henlopen State Park, this is your call to action! While the temps were too sweltering to do much hiking, we did get in some early morning trail time while we were visiting. 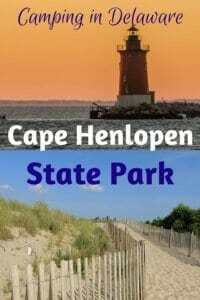 Here a run-down of some of the awesome trails in Cape Henlopen State Park. Walking Dunes Trail — We meandered along the Walking Dunes Trail, hoping to catch the sunrise over the east coast. The clouds thwarted our plans, but the trail didn’t disappoint. The huge diversity of birds made quite a ruckus in the tidal marsh and we didn’t see a single human for more than two hours. This is an easy hike — through dunes, woods, and a bit of pavement. The only downside is the limited shade and a bit of poison ivy. 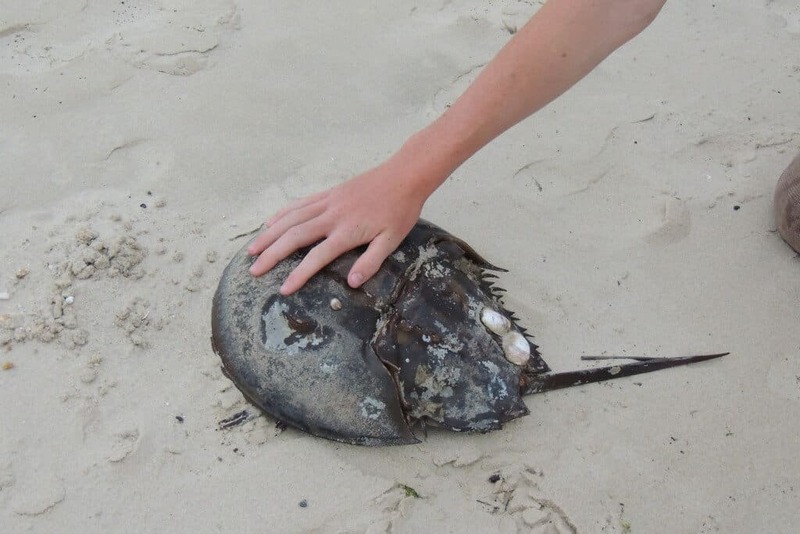 The bay was full of horseshoe crabs. Bike Loop — Did I tell you that bike rentals are free at Cape Henlopen State Park? The trails, the roads, and even the nearby town of Lewes are all very bike friendly. It’s a great way to explore this huge park, and there’s nothing like letting the waves wash your sweat away after a grueling ride from the campground to the sea. The bike loop trail is an awesome way to get around the park. You can stop off at the nature center, the Cape Henlopen fishing pier, the kayak rental shop, and the observation tower. The trail itself is flat and paved, perfect for seasoned riders and training wheels alike. Pinelands Nature Trail — Thanks to a raging storm, we didn’t have time to check out this trail, but all the park rangers recommended it to us. It’s a two-mile path through the woods, where you’ll get a glimpse of the old military bunkers and a cranberry bog without even breaking a sweat. Please let us know about your hike if you decide to give it a go. The lighthouse is just off the point. As if the crashing waves, meandering trails, and absolute beauty weren’t enough, there’s even more to Cape Henlopen State Park. If you’re a family that needs options, here are a few more ways to wile away the day. Climb the observation tower – Part of Fort Miles, the tower sits right on the bike loop. It offers 360 degree views of the surrounding park, and is a great spot to watch the sun come up. Visit the bunkers at Fort Miles – Fort Miles was a key piece of our nation’s coastal defense during World War II. The fort was in operation until 1958, when long-range missiles brought an end to harbor defense strategies. You can get a guided tour of the fort Monday through Friday from 8 to 4. Rent kayaks – Tour the bay on your own, or take part in a seriously fabulous guided tour. The park rangers and naturalists know so much and they love to share their knowledge with visitors. You’ll learn about the birds, fish, and mammals that live here, plus you’ll experience the park from a whole new perspective. The sunset tour promised to be amazing when we were there, but a giant storm kept everyone out of the water. Now we have an excuse to go back. Watch the sunrise – Nothing like a sweet Atlantic sunrise to make the rest of your day fabulous. Watch the sunset – Over the bay as the tide goes out, you’ll likely spot dolphins frolicking, pelicans fishing, and awesome people enjoying the world just as much as you are. Check out the Nature Center – It’s a mini-aquarium, complete with a touch tank, local fish, and lots of cool info about this special ecosystem. Play disc golf – 18 “holes” of Frisbee fun. I’m having trouble learning the sport, but the courses seem to be popping up in parks and campgrounds everywhere, so I’m giving it a go. Fish of the Cape Henlopen Fishing Pier – Word on the street is that the fishing pier has some of the best saltwater fishing on the east coast. I’m not an angler, so you’ll have to be the judge, but the pier was super busy when we visited. Cape Henlopen is a huge park on the Atlantic Ocean that kept us captivated from the moment we arrived. 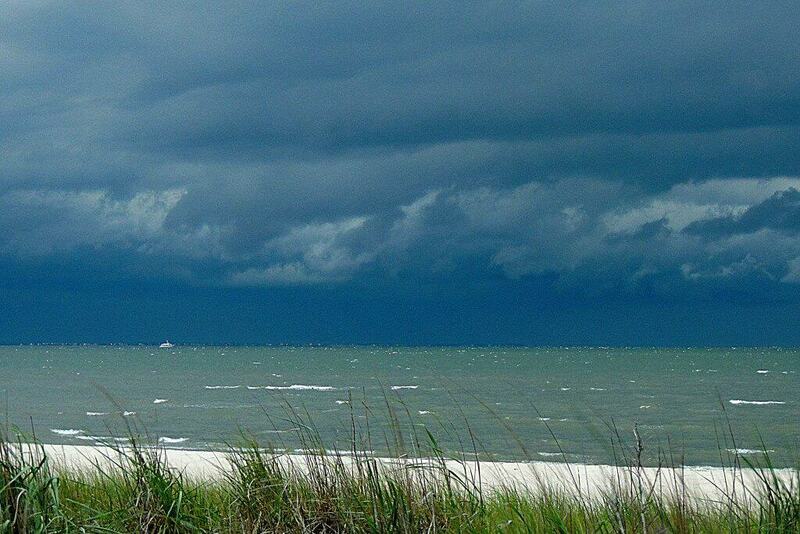 If you like a side of rugged and wild with your beach vacation, you won’t be disappointed. You’ve got a sweet little beach town nearby with shopping and dining if that’s your thing; the beach is as lovely as any on the Atlantic Coast, and there’s plenty of room to spread out and explore. Have you been to this magical place? We’d love to hear about your experiences. 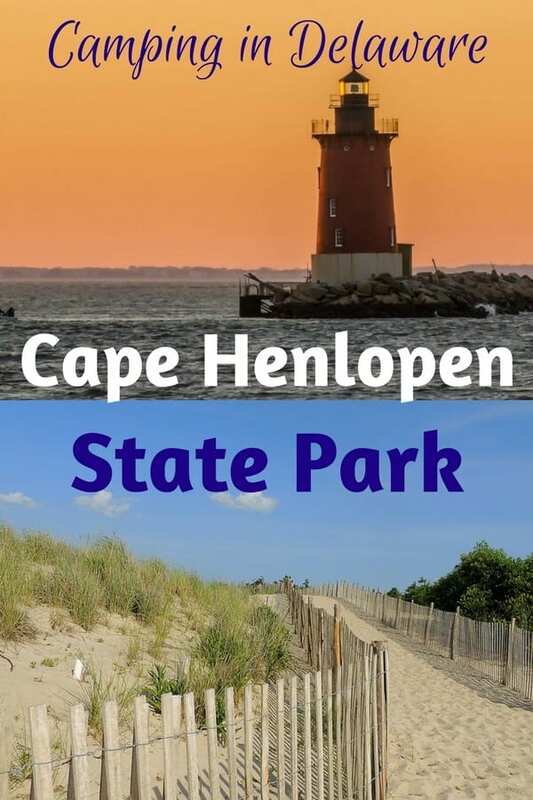 Delaware State Parks – Find out more about Cape Henlopen State Park, as well as other awesome parks in Delaware. Lewes Chamber of Commerce – This cute town is just outside the park and totally worth a visit. This website gives an overview of the town, as well as dining, lodging, and shopping ideas. Cape May, NJ – Cape May, NJ is right across the bay from Lewes, DE. Not only is this an adorable seaside town, it’s also one of the premiere birding spots in the United States. 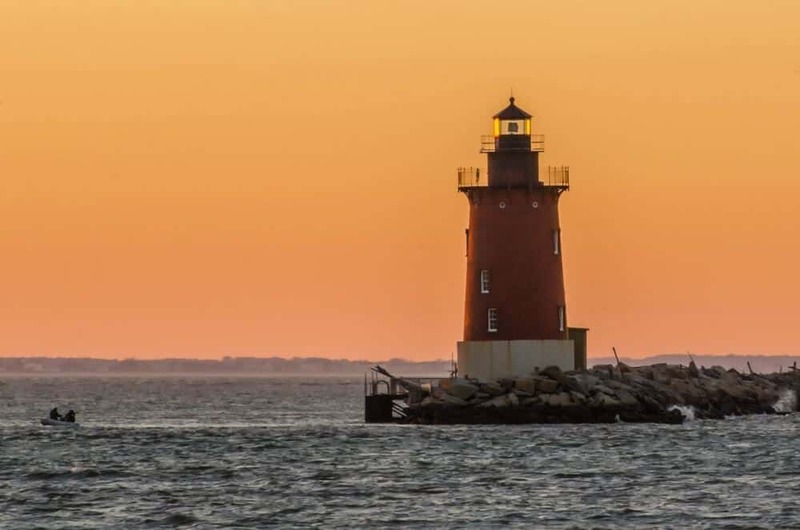 Check out CapeMay.com for information about exploring the town. If you found this post helpful, would you mind sharing on Pinterest? Thanks! I’m taking my kids tent camping here next week. Thank you for all the useful information. If the forecast holds it won’t be too horribly hot, but you’ve left me feeling a little apprehensive about the insects. I also need to put some thought into our meals and snacks! Everything you said & more!! When my children were younger (much) I would take them on camping weekends to Cape Henlopen. To this day, any quick trip I do is to the beautiful park as it is one of the VERY few beaches you can bring your dogs during the summer months. Yes!!! It’s hard to find quiet, dog-friendly beaches, especially in the summer. Thanks for stopping in, Max! What a beautiful place — easy to see why you liked it. I would love to go to this park whenever I make it to Delaware! I also have to comment that you sound a lot like me living in different states, although the furthest East I lived was Ohio. It’s really a great park for relaxing and exploring, Jessica. I’m so glad I was able to move around when I was younger. It’s really helped me to appreciate traveling as an adult. This looks beautiful! My parents live on the Jersey shore, and I really want to take the ferry over to Lewes from Cape May one of these summers. It’s a great ferry ride, Annemarie – and I love Cape May! That looks like a really beautiful spot! I’m in New England too, so maybe I’ll have an opportunity to check it out sometime! Never been to Delaware, but looks like a beautiful place. Oh I wish I was there right now! I miss the beach! Looks like a fun place to visit! I love any place with a lighthouse! I’ve been to a lot of states, but I’ve never been to Delaware. This place looks beautiful. I love the picture of the lighthouse. Such beautiful pictures! I haven’t explored that area of the country at all, but it’s definitely on my list. This sentence made me laugh out loud, by the way 🙂 “If you’re a northerner suffering through a sweltering summer day, take the car and don’t feel guilty.” Though I was born in Texas, I have lived in Minnesota, Wisconsin, and now Wyoming … this girl doesn’t do well with anything over 80-degrees. Thanks for the comment, Daniela. I definitely do not appreciate the heat. Working on it, though! Our family drove through here last week. It’s true that the park is beautiful, but the town does not look fondly on RVs.